Heat oven to 400°F. Spray 13x9-inch (3-quart) glass baking dish with cooking spray. In 10-inch skillet, cook sausage over medium-high heat, stirring frequently, until no longer pink; drain. In large bowl, mix water, milk and margarine. Stir in 2 pouches Potatoes and 2 pouches Sauce Mix. Stir in sausage and 1/2 cup green onions until well blended. Pour potato mixture into baking dish. Bake uncovered 35 minutes. Top with 2 tablespoons green onions. Bake 5 minutes longer or until potatoes are tender. Let stand 5 minutes before serving (sauce will thicken as it stands). 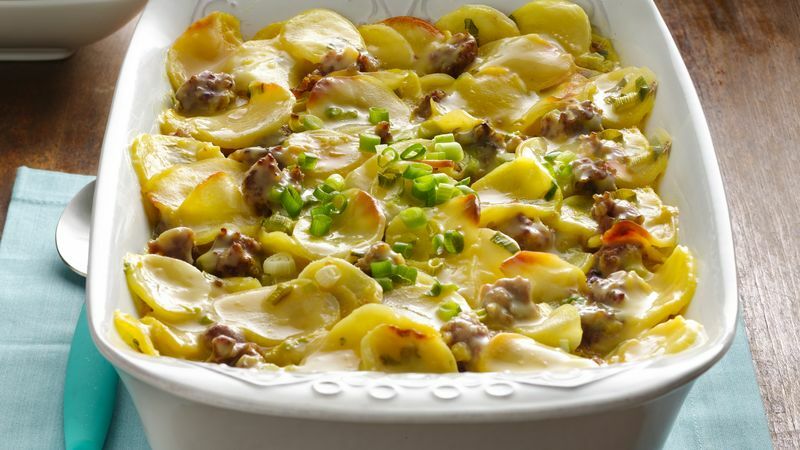 Pair a tossed green salad with this hearty casserole.